How Does A Come-A-Long Winch Operate? 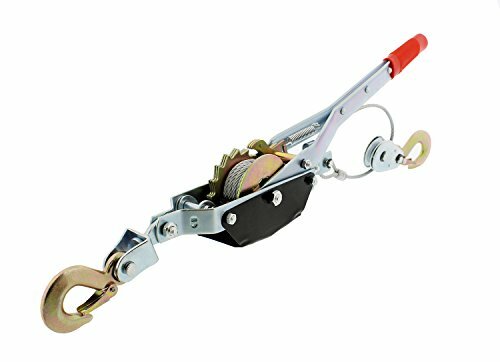 The cable puller winch – also known as a come-a-long or hand winch – is the jack of all trades when it comes to a variety of pulling, lifting, or stretching tasks. 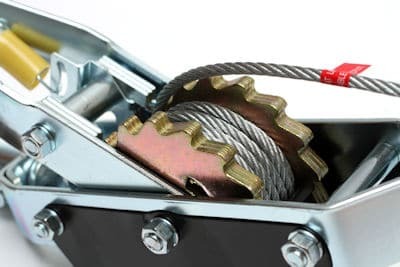 A good cable puller winch can save your bacon if you are stuck in the mud, or need to pull a framed wall into place during construction, or drag a trophy buck or moose onto a trailer. It isn’t a one trick pony like a 2 post car lift – the portability, versatility, and affordability of this amazing winch make it a must-have tool for your garage or vehicle. Our top choice for the best come along winch in this review is the Tekton 5547 4-Ton Dual Gear Power Puller. First and foremost, the 5547 is powerful, utilizing a dual gear pulling system to generate 4000 pounds of pulling power that can be increased to 8000 pounds by doubling the cable. 4 tons is a lot of force – twice as much as our 2nd choice unit – meaning that the Tekton come-along will handle most pulling needs. The dual gears of the 5547 evenly distribute the load, allowing you to pull heavy objects easily – often with just one hand on the 21-inch handle. And the quarter-inch aircraft grade braided steel cable can extend to a max length of 12 feet and 7 inches, giving you plenty of reach. The entire unit is made with corrosion-resistant steel, meaning that it is built to last. A survey of hundreds of purchaser reviews on Amazon are overwhelmingly positive, with the cumulative average close to 4-stars. Some users did complain of issues with the cable getting stuck, making it difficult to extend. But the vast majority of respondents seemed to be very happy with their purchase. If you are in the market for a strong come-along winch, the Tekton 4-ton puller is worth a look. Given the superior load capacity, quality design, and the fact it can be had at a great price, makes the Tekton 5547 a great choice. The 2nd best option in our roundup of cable puller winches is the Maasdam Pow’R Pull 144S-6. The Maasdam is proudly made in the USA, and features professional grade quality construction and durability. The 2000 pound pulling capacity is significantly less than our top choice, but is still more than enough for most common tasks that call for a cable puller winch. 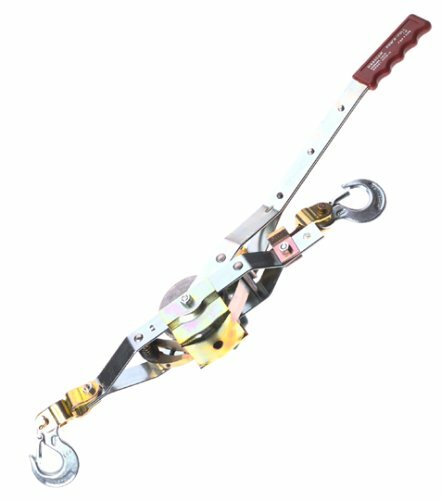 The 144S-6 comes with 12′ of 3/16 inch galvanized, aircraft quality cable to pull your load. It also features an aluminum alloy ratchet wheel that is precision cast, and both the handle and frame are made from high-strength, cold rolled tempered steel. All of that adds up to a durable piece of equipment. The reviews from purchasers of the Maasdam Pow’R Pull are exemplary, earning a stellar 4.6 out of 5-star rating. Words like “powerful”, “tough”, and “reliable” make frequent appearances in owner reviews. The fact that 94% of reviewers give either a 4 or 5-star rating to the 144S-6 is a testimony to the unit’s quality. The quality construction and strong owner reviews are why we chose the Maasdam Pow’R Pull as our #2 choice for best come along winch. And the competitive price makes the Maasdam 144S-6 even more attractive. 1 Ton Capacity USA Made Pow'R Pull with 3/16" diameter cable. 12' Maximum Lift. The third item in our review of the best come along winches is the ABN 2 Ton Single Gear Hand Puller. 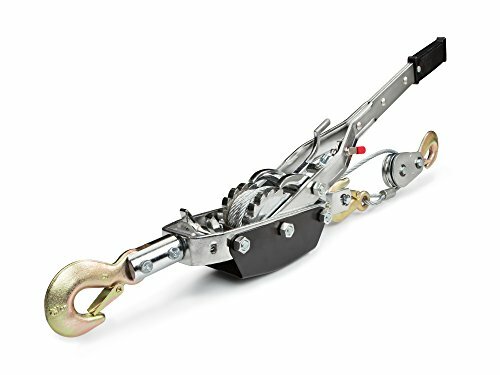 As the name implies, the capacity of this winch is 4000 pounds, which puts it between our other two entries in this round up. And in many ways the ABN’s other features seem a combination of the first two as well. For example, the Maasdam unit boasts that it is made in the USA, while the ABN unit is manufactured in China but sold by a US company. But despite the unit’s origin, the winch itself appears to be well made. 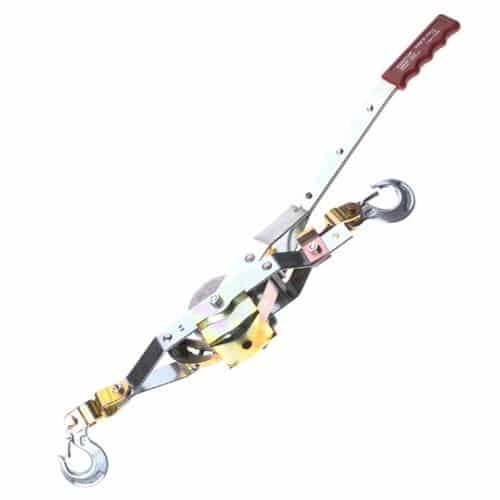 The ABN 2-ton puller is made from heavy gauge flat stock steel, and the ratchet and pawl are also constructed from steel. The hooks are drop forged for strength, and also include spring latches for additional safety. And the cable in the ABN unit is 12′ of aircraft cable. These features make it ideal for common come along tasks such as moving heavy equipment, tightening a fence, removing tree stumps, or winching a boat onto a trailer. 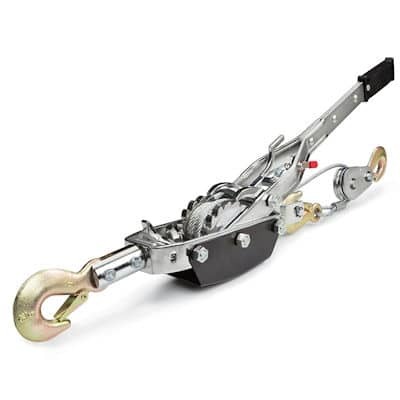 Online reviews of the ABN puller are exceptionally positive, with all of the respondents rating the unit at 4 or 5 stars. Owners after owner mentioned that the unit was solid and worked as expected, which is just what you want in a come along. And given that the ABN 2-ton has the lowest price in our roundup, it is a great bargain despite having a lower capacity than our #1 choice. 2 HOOKS FOR VARIOUS APPLICATIONS: 3/8-inch (9.5mm) hooks with 7.8-foot (2.4m) pull length can be used to move heavy equipment, tighten fencing, landscaping such as removing tree stumps or debris and assist in loading a boat onto a trailer. 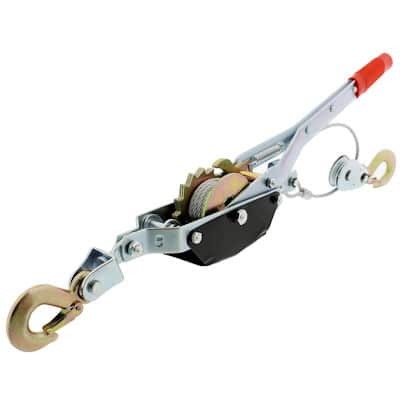 A cable puller winch is made up of a lever arm and a body. At one end of the body is a fixed hook, and at the other end a hook attached to a cable runs out through a guide. The other end of the cable is attached to a drum in the center of the body. The lever is attached to a gear mechanism that rotates the drum. There are also two latches on the body – one prevents the drum from unwinding while at the same time applying tension to the spooling end with the lever arm. The second latch is attached to the lever, and advances the spool (thus coiling the wire) as the lever is pulled. The mechanical advantage of the gears means that a relatively light force on the lever translates into a much stronger pulling force on the cable. Heavy-duty models are rated to pull loads as large as 5 tons! Metal – the type of metal used in a come-a-long’s manufacturing will have a huge impact on its price and operation. The use of high grade steel is best, as it has high shear tolerance that will keep the unit from failing under a heavy load. Construction Type – Another factor in unit strength is frame construction. The better units use single-piece construction of the external frame. The use of multiple pieces bolted or welded together make for more failure points on the winch. The use of heat treated bolts is also important, as they are less likely shear off under heavy use. Gear Construction – Inexpensive cable puller winches often use gears made from inferior metals. These components will wear quickly, meaning the life of a cheap hand winch will be much shorter than a higher-quality unit. Inspect Cable & Attachments – A frayed cable, strap, or rope can snap when the come-a-long applies tension, so it is important to make a visual check before using the hand winch. A snapped cable can cause significant injury, as the sudden release of force can make them move fast enough to cut. And depending on how you are using it, you or others could also be injured if your load suddenly breaks free. Know Your Weights & Load Capacity – Some items such as logs and rocks weigh much more than you might think. Trying to use a cable puller hoist to lift more than it is rated for is dangerous, as components may shear or buckle once the load is applied. It is better to buy a come-a-long that is rated above your expected loads than risk injury or damage from one that is inadequate. Practice On Lighter Loads – Using your come-a-long to pull loads that are well under the unit’s capacity will help familiarize you with how it is supposed to operate under normal conditions. This familiarity with the device will give you insight if you ever do attach a load that is too much for your hand winch, so you will recognize the signs of overloading and be more likely to stop before any dangerous breakage or device failure occurs.